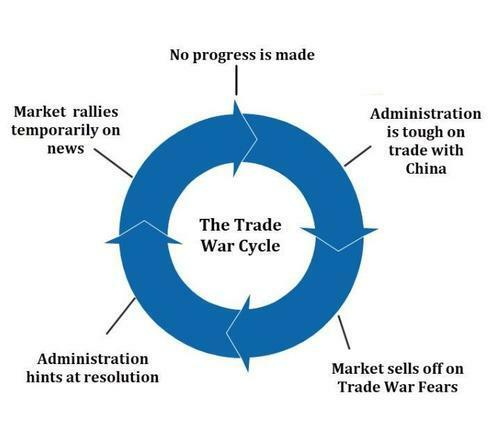 Bubblevision wants no part of anything “fundamental.” It’s all “narrative,” as it must be to keep the casino running. That’s because the earnings recession has started. At the end of the third quarter of 2018, the consensus estimate pointed to 6.7% year-over-year growth for earnings per share for the S&P 500 Index. Wall Street expected to see $176.49. By the end of December, that forecast was 3.3%. Now, we’re looking at negative 0.8%, with six of the 11 sectors in negative growth territory. Wall Street thinks it’ll get $167.64 per share. Let’s go deeper into this question of earnings. Let’s look at a measure of business profits that not distorted by accounting games and financial engineering. 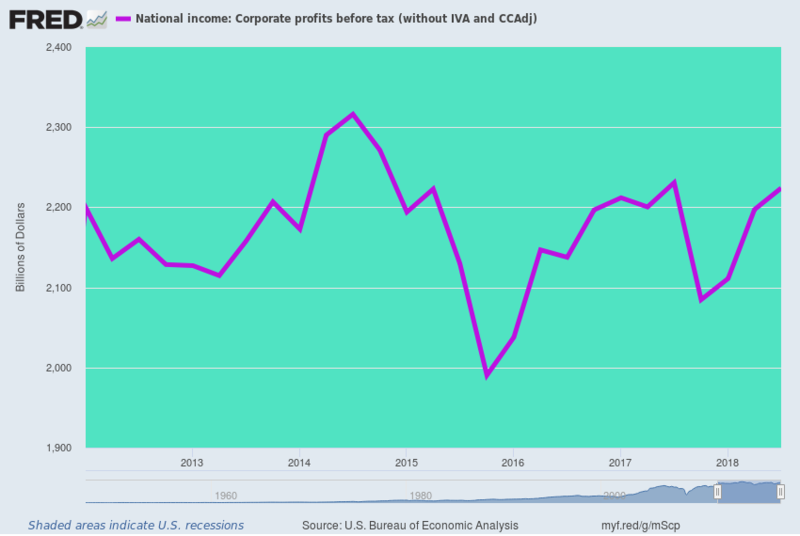 The national income and products accounts (NIPA) remove the one-time impact of the Trump tax cut and other games played with corporate profits by sell-side analysts. For the period ended September 30, 2018, annualized pre-tax corporate profits posted at $2.224 trillion. That’s 4% lower than the peak recovery level reached in September 2014. It’s barely above the level reported way back in the first quarter of 2012. Whatever the chart monkeys have been buying since the Donald arrived in the Oval Office, it most certainly is not an acceleration of organic profits growth in the U.S. economy. That’s because there’s been none. Lack of real growth is only half the story. There’s about $14.8 trillion of business debt now in place. And it’ll be generating ever-rising interest expense. Meanwhile, the $15 trillion in stock buybacks, dubious M&A deals, and excess dividends paid out by Corporate America since 2006 will be adding precious little to future earnings and cash flows. One fundamental reason why monetary central planning is counterproductive is that it destroys “price discovery” for borrowers and lenders. As business debt outstanding marched steadily higher after the Global Financial Crisis, interest expense declined. On the eve of the GFC, the corporate piece of nonfinancial business debt stood at $6.06 trillion. Interest payments were $605 billion. That’s an average interest rate of 10%. By the first quarter of 2017, non-financial corporate debt had grown to $8.7 trillion. But annual interest expense had declined to just $491 billion. That’s an average interest rate of 5.6%. That 5.6% yield was exactly the wrong price signal because it was artificial and unsustainable. But it’s also the reason CEOs and CFOs mortgaged their balance sheets to buy back stock and fund dubious M&A deals. Ultra-cheap debt made leveraged acquisitions look accretive to earnings because the added interest expense on the acquired assets was so low. It also made buybacks look accretive because the incremental interest was far outweighed by the decrease in the share count. The bottom line is Corporate America has a glass jaw. For the 12 months ended December 30, 2018, reported earnings based on Generally Accepted Accounting Principles and excluding the one-time impact of the Trump tax cut were $124 per share. That’s up from $85 for the 12 months ended June 30, 2007. But $30 of the $39 apples-to-apples gain is about easy money, lower share counts, and the one-time impact of the 21% corporate rate cut. It’s not about organic profit growth. And the Mother of All Yield Shocks will shatter all of it.